Optimism is ready to open with about 8 beers on tap December 5. Grand. That is the word that comes to mind when you enter Optimism Brewing, located at the corner of Broadway and Union in Capitol Hill. In a neighborhood like Capitol Hill, where property values are through the roof, it is refreshing to find a project such as Optimism. 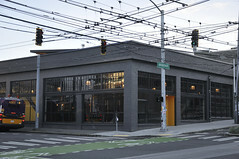 Owners Gay Gilmore and Troy Hakala have taken a building that was slated to be torn down and converted into condos and turned it into the largest brewery tasting room in Seattle. With capacity for more than 400 customers, they are set to make a big splash in the Seattle brewing scene when they open for business on December 5. They recently tore the paper down from the windows of the brewery, and now when people walk by they stop and stare. The sheer size of the setting of it all in one gigantic room is unlike anything else in Seattle. My pictures certainly don’t do it justice. It has been a long road for Gilmore and Hakala. They began looking for a space several years ago, and they started construction in March 2014. Because of strict code requirements that were difficult to implement solutions for in the older building, the brewery was under construction for almost two years. But, the hard work has paid off. 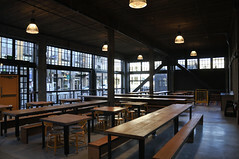 Hakala says, “We built a place that we hope people will like to come to…we just wanted to do it the right way.” The 16,000 square foot space previously housed a car dealership, and the high ceilings and open interior mixes in the feel of a beer hall with the visible brewing setup right in the middle of everything. The character of the restored old building shines through. After all the hard work they have put in, Gilmore and Hakala are excited to announce that the Grand Opening date for Optimism will be on Saturday, December 5. The brewery will then be open 4 days a week to start, from Thursday through Sunday. Days and hours will expand as they get their feet under them. Optimism will shy away from using traditional style names to describe the beers to customers. 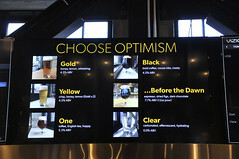 As for what you’ll find on tap at Optimism, the selection will change continuously. They plan to make a wide variety of styles driven by whatever customers want to drink. Hakala says, “As a homebrewer, I just wanted to brew every single style to learn about it and understand it. So, I don’t think there is anything we won’t do.” They have chosen a lineup of beers for the opening, but you want find style designations like you do at most breweries. Instead of using styles to describe a beer, they will be be using flavor descriptions to let customers know what they are ordering. Opening beers will include Gold (honey, lemon, refreshing; 4.5% ABV), One (toffee, English tea, hoppy; 5.3% ABV) and Before the Dawn (espresso, dried figs, dark chocolate; 7.7% ABV). They plan to have eight beers on tap for the opening, and they have room to expand to around 20 offerings on tap at once. 20-barrel brewing system with 40-barrel fermenters. This is not a brewpub and they will not offer their own food; they want to focus on the beer. But, they have a loading area space in back where they plan to bring in rotating food trucks, and there are tons of take out food options around the brewery that you could bring in. All beers must be purchased at the bar; no table service for purchasing (they will clear, though). I love this…it’s one of the things that makes Beveridge Place Pub in West Seattle work so well in my opinion. They will accept credit and debit cards only; no cash. No tips allowed. Optimism says, “We believe our business should be responsible for our workers’ wages, not the whim of its customers. Nor should the people who serve our product end up making more than the ones who create it.” Cheers to that. They have a ton of unisex bathrooms. It’s kind of an awesome setup…you’ll see. When they serve a beer in a “pint”, it will be a true pint. They’ll use glassware that can hold up to 20oz in order to accommodate a proper head on top of the beer. All of the servers at Optimism will be Cicerone Certified Beer Servers. The tasting room will be kid-friendly, and they even have a play area back in a corner. Don’t want to hang out with the kids? No problem. The place is huge….you’ll find a spot far away from the play area. They have a sensory analysis room for blind tasting where staff members and possibly the public will get to evaluate beers. 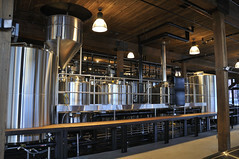 The brewery includes a laboratory where they will test their product and processes. The brewery is literally right in the middle of the building and the tasting room surrounds it. You really feel like you are hanging out in the brewery. 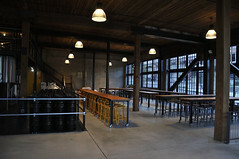 They will have room in the basement for barrels, and they plan to do sour beers, imperial stouts and other strong ales. They were very close to ending up in the building where the Starbucks Reserve Roastery now sits. Cheers to the team at Optimism for making the brewery a reality after a long process. 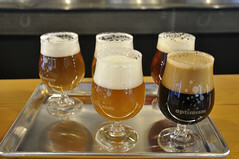 Visit the Optimism Brewing website and Facebook page for up-to-date news on the opening and other items. Corner of Broadway & Union. The side of the tasting room facing Union. This is all sit down tables, with a kids area in the back. The courtyard where customers will access food trucks is off to the right of this pic. The side of the tasting room facing Broadway. All bar-height seating. There is also a large standing room area with beer rail off to the right of this pic. 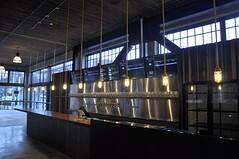 There will be room for about 20 total beers on tap at the expansive bar. 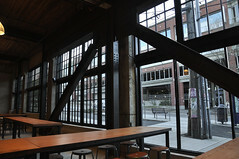 The steel “V”s and posts are new in order to bring the building up to current seismic code, but they blend in nicely with the old feel of the interior. Great story Geoff! …love the details about reclaimed wood—sounds sort of similar to the Fort George gorgeous industrial space w/ its 2×12 ceiling timbers. Can’t wait to check out the place!